Not a stand alone game : Requires an original copy of Ticket to Ride™ or Ticket to Ride Europe™ to play. I’m a big fan of the Legendary Asia map. To put it bluntly, it is absolutely brutal. As in Ticket to Ride: Europe, you receive 1 long route and 3 short routes to choose from. From my interpretation, the rulebook doesn’t specify that you must keep the long route (I may have overlooked it) but we decided as a house rule that this was a must. It just adds so much tension and makes every decision important. The usual double route rules apply, but on this map you should expect to be blocked somewhere and have to work a way around. Particularly around Northern India, the cluster of small routes will be snapped up very quickly as everyone panics, but tries not to blink first and give themselves away (encouraging other players to block them). Being forced to use the mountain routes will drain your train supplies and force you to question whether you can really afford to gamble on extra tickets. The mountain routes do provide a points bonus though, to prevent them being too much of a handicap. I’d recommend the box for this map alone, it’s great fun as you pray you won’t be the one with his head in his hands, wondering where all those blue cards you wanted had gone. On the other side of the board, make sure to give the team game a try. I was sceptical at first but it’s grown on me and is a nice variant, and of course makes the game accessible to six players. 2011 was a good year for Ticket to Ride, the introductory railway themed board game from Days of Wonder that won the Spiel des Jahres and the Origins Award for Best Board Game in 2004, as well as the 2005 Diana Jones award. In its closing months, the publisher inaugurated a new line of expansions in the form of the Map Collection series. Each title in the series features two new maps – on a double-sided map board – as well as new tweaks to the core rules that provide new challenges and playing experiences. The first of these is Map Collection Vol. 1 – Ticket to Ride Asia, and it was quickly followed by Map Collection Vol. 2 – Ticket to Ride India, each of which requires the use of the Train Cards and Trains from Ticket to Ride or Ticket to Ride Europe to play. It is the first of these, Map Collection Vol. 1 – Ticket to Ride Asia, which is being reviewed here. So in keeping with the series, Map Collection Vol. 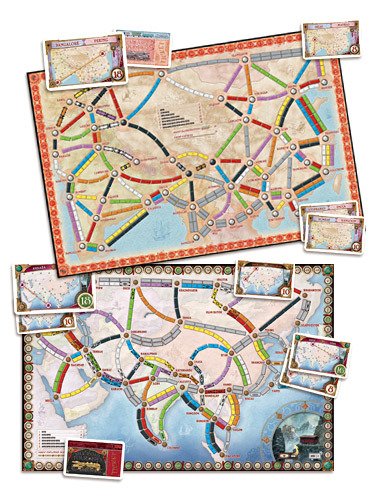 1 – Ticket to Ride Asia contains two maps. The first of these is the Team Asia map, which introduces two elements that sell the Map Collection. One is team play, the other is the addition of another player, increasing the number of maximum players in Ticket to Ride from five to six, but requiring four or six players only. The second map, the Silk Road themed Legendary Asia, is more of a traditional affair designed for two to five players that harks back to Ticket to Ride Europe, but which adds a tweak of its very own. Team Asia was designed by Alan R. Moon, who also designed Ticket to Ride, whilst Legendary Asia was François Valentyne’s entry in a competition to design and have published a new map for Ticket to Ride. Each of the entries in the Map Collection series comes in a two-inch deep album sized box. Inside Map Collection Vol. 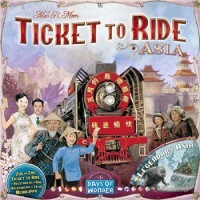 1 – Ticket to Ride Asia can be found the new double-sided map, forty-five Trains (nine for each of the Train colours to be found in Ticket to Ride and Ticket to Ride Europe), thirty-six Destination Tickets for Legendary Asia, sixty Destination Tickets for Team Asia, six wooden card holders, and two full-colour rule books. There is one each for Team Asia and Legendary Asia, and both are twelve pages long with the rules for each map being just a page long and given in ten languages. All of these components are nicely done and nicely packaged in the box with the two maps, one per side, being very attractive. If there is an issue with either map, it is that neither clearly state which variant they are for. Whilst the graphics for each map and accompanying Destination Tickets are similar, so is the geographical region that both maps cover, and it would have been simple enough for the designers to put the name of the variant on its map. This would make game choice and set up just that little more easier, and that much quicker. Of course, there is the usual problem of learning the geography to be found in Map Collection Vol. 1 – Ticket to Ride Asia, but there is plenty of similarity between the two maps in this expansion, and anyway, not only do the mini-maps on the Destination Tickets help, but learning about geography as basic as this and whilst playing Ticket to Ride, is after all, fun. The changes in the Legendary Asia variant begins with its Destination Tickets. There are thirty-six of these, of which six are Long Route Tickets, such as Moscow to Calcutta and Khabarovsk to Karachi, that are worth sixteen, seventeen, or eighteen points. At game’s start, each player receives a single Long Route and three normal Destination Tickets of which he must keep at least two. Later in the game he can choose to draw three Destination Tickets of which he must keep at least one. Opening up the map for Legendary Asia and it looks not unlike the map for Ticket to Ride Europe. There several ferry Routes which require the expenditure of wild or Locomotive Cards to complete in addition to the usual Train Cards, but there are also several where the one or two spaces on a Route are marked with an “X” such as between Kathmandu and Mandalay, a two-space Route with an “X” on both spaces. These are Mountain Routes, which when claimed, require a player to not only expend the Train Cards of the appropriate colour, but for each “X” on the Route, to also expend one of his Trains! This represents the wear and tear on the trains that traverse these Routes and is not as bad as it sounds, because for each Train discarded, he scores an additional two points. So to claim the purple Kathmandu-Mandalay Route, a player has to discard two purple Train Cards and two of his Trains, but scores two points for the Route claimed and another four points for the Trains discarded. In addition some double Routes, such as that between Perm and Omsk has one Route that does not require the discarding of a Train Card and one that does. In other words, one Route does not go through the mountains. In most, but not all cases, the non-Mountain Route is a grey Route, meaning that any Train Card colour can be used to complete them. The effect of the Mountain Routes is twofold. First, it increases the completion value of some of the map’s shorter Routes. Compare a three-space Route, like that between Moscow and Astrakhan, which would score a player a simple four points for completing, and the two-space Mountain Route between Agra and Kathmandu which has one space with an “X” and which would score a player a total of four points to complete, two points for the Route itself and another two for the Train discarded. Second, the expenditure of Trains to complete Mountain Routes can be used to speed play towards the moment when a player has four Trains or less and thus trigger the game’s round of last turns. The other additional rule in Legendary Asia is that of the Asian Explorer Bonus. This is awarded for the highest number of cities connected rather than the Longest Route as on many other Ticket to Ride maps. This encourages the creation of a network of Routes rather a single long Route and emphasises the value of the shorter Routes as they are generally easier to connect to and thus create a network with. Overall, Legendary Asia feels like a traditional Ticket to Ride board. It offers a new map, but not a radically different playing experience. It is the easiest to adapt to, and in terms of complexity, sits nicely alongside Ticket to Ride and Ticket to Ride Europe. Team Asia though, is a different experience. It offers complexity via a radical means of play that also restricts the number of players. It is played with teams of two players, with space for either two teams or three teams. Which means that there must be a minimum of four players if there are two teams playing, and a maximum of six players if three teams are playing. During the game the members of a team have to sit together with two of the wooden cardholders sat in front of them. These cardholders are used to store the team’s shared Destination Tickets and Train Cards, this sharing being the only means that the members of a team can communicate. In other words, during play, a team cannot talk about the Destination Tickets that either has to complete nor about what Routes that either wants to complete. At game start, each team receives its cardholders and a total of fifty-four Trains in the same colour, the extra ones being provided with Map Collection Vol. 1 – Ticket to Ride Asia. The Trains are divided equally between the two members of a team so that they have a pool of twenty-seven each. During play, a player will draw only from his supply of Trains and just like standard Ticket to Ride, when their combined supply of Trains reaches four or less, the end game rules are triggered in which everyone has one last turn, including his teammate. So a player has to keep an eye on his supply of Trains as well as those belong to everyone else, including that of his teammate. Then the secrecy begins. Each player receives four Train Cards as normal and a total of five Destination Tickets, of which he must keep three. Out of the kept Destination Tickets, a player must take one and simultaneously with his teammate reveal it and place it in one of the shared cardholders. When a player later draws additional Destination Tickets, he must not only keep one of the new Tickets, but also place one of the Tickets in his team’s cardholder used for their Tickets. Similarly, when a player draws Train Cards, he draws two as normal, but one of them has to go into his team’s cardholder used for the Train Cards. This must be done as they are drawn – a player cannot draw two and decide which of these Train Cards to share. One additional option that a player has during play is that he can choose to share two of the Destination Tickets in his hand with his teammate by placing them in their shared cardholder. Whilst this can be helpful, it does deny that player the opportunity to pick up new Train Cards or claim a Route. During the game, play order is by team. Both players on a team will take their turn one after another, then the players on the next team will have their go, and so on. Players in a team always take their turns in the same order. At game’s end, the members of a team scores together. A ten point Asian Express bonus is awarded to the team with the Longest Continuous Path on the board whilst a ten point Globetrotter bonus is awarded to the team who has completed the most Destination Tickets. Looking at the Team Asia map, it looks quite open, if not similar to the layout of the Ticket to Ride map of the USA with its long Routes over the top in the North, and shorter Routes to East and South. Three triple Routes run the length of the Chinese coast. In a two-team game, two of these triple Routes can be claimed, possibly by both players on a team, thus wholly blocking that Route to the other team. The map also contain two unnamed destinations – they cannot be cities as neither is named – that are black instead of the grey of the map’s actual cities. Being close to Kathmandu and Lhasa, they are probably the peaks of Everest and K2 in the Himalayas. The other addition to the Team Asia board is not a new type of Route, but a variant upon a type of Route – the Tunnel. On maps with Tunnels, such as Ticket to Ride Switzerland and Ticket to Ride Nordic Countries, if player wants to claim a Tunnel Route he has to draw three more Train Cards from off the top of the draw deck, and if any of the drawn cards match the colour of the Route, that player must pay an extra Train Card for each extra drawn. If he cannot, he forfeits that turn. In Team Asia, the number of extra Train Cards varies, being determined by the number of the Route. For example, the yellow Route between Lhasa and Cawnpore is one space long, but is marked with a six, meaning that it requires a player to draw another six Train Cards and hope that he does not draw any yellow Train Cards and so have to pay extra Trains Cards. As with Ticket to Ride Switzerland and Ticket to Ride Nordic Countries, a player could also use Locomotive Cards to complete a Tunnel Route in this fashion. Overall, this makes Tunnels a much riskier affair and more difficult to complete. In purely mechanical terms, Team Asia is not a complex addition to the Ticket to Ride family. In play style, it is much more complex, not just for the fact that the players within a team have to keep quiet about strategy, but also for the fact that Team Asia is not a five, or indeed, a six-player board. Rather, it is a two or three player board that it is as tight as Ticket to Ride Switzerland and Ticket to Ride Nordic Countries before it, though with more trains between the members of a team than is the norm. Another factor in Team Asia that is similar to Ticket to Ride Switzerland is the high number of Destination Tickets. There are sixty in this set, and like Ticket to Ride Switzerland, once a player has completed his current Destination Tickets, there is the chance that a player will draw new Destination Tickets that he has already completed. It should be made clear that this is not as extreme as in Ticket to Ride Switzerland, which many players of Ticket to Ride consider to be broken for this reason. In our playing experience, this is less of an issue in Team Asia as there is less replication of Routes. Team Asia feels almost, but not quite as tight as the other two or three player options, Ticket to Ride Switzerland and Ticket to Ride Nordic Countries because its tight play is offset by the higher number of Trains that each team begins play with. The co-operative, though silent play, adds another level of enjoyable challenge to the game and means that this variant requires a bit more thought than is the norm with Ticket to Ride. The means of adding a sixth player is innovative for Ticket to Ride, and the fact that it involves team play means that it still leaves room for someone to design a Ticket to Ride board for use with six players rather than three teams of two. Similarly, the addition of Team Play raises the question of how many other Ticket to Ride maps would its rules work with, something for the game’s fans to experiment with. For years now, Ticket to Ride has not been receiving the support that it should have been. It did not need dice or a card game variant, nor did it need kaiju themed bits of plastic that were never in keeping with the line’s late nineteenth century, early twentieth century style. What it needed was new maps. Ticket to Ride is a train game. A very light train game it must be said, but train games are all about connecting Routes to new places, whether familiar or exotic. Every single other train game series does this and it works because gamers like new maps and the new challenges that they present. It has been three years since the release of a new map expansion in the form of the two-three player base game, Ticket to Ride Nordic Countries. It has been four years since the release of Ticket to Ride Switerland, the map expansion that sets the pattern for the Map Collection series, which appears in Map Collection Vol. 2 – Ticket to Ride India. Hurrah! And “Hurrah!” again, because the wait has been worth it. Map Collection Vol. 1 – Ticket to Ride Asia is an excellent expansion that really does add to the Ticket to Ride family. The Team Asia gives a clever means of adding a sixth player to Ticket to Ride combined with a nice hidden objective dynamic between the members of each team. Despite it being a four or six player game, the organisation into team actually turns it into a tight two or three player board. Lastly, the six wooden card holders are nice additions can actually be used in Ticket to Ride game to hold and organise each player’s cards. The Legendary Asia is a more traditional board that offers less radical play than in Team Asia and is the easier option to get out and play. Together, Legendary Asia and Team Asia combine to make Map Collection Vol. 1 – Ticket to Ride Asia a great start to a new series of expansions and a cleverly designed challenge for the Ticket to Ride fan. You’re trying to complete routes on the board that match the cards you have in your hand (some picking and choosing ability). You don’t know what routes other are trying to complete, some connections only allow two people to use them. More points added (or deducted) for completing longer routes. For some reason I really didn’t like the mechanics. This is apparently a very popular game, so another version may have worked better for me. This version seems to have one of the more difficult boards. In this expansion, you are given the option to play team Ticket to Ride. This, I find, really adds a cool twist to the game,secretly suggesting moves to your teammate without giving away explicitly what you are doing. For the tandem game alone, this is worthwhile. The card sharing and ticket sharing mechanic is what essentially makes this into team play, because your communication is very limited, and you are limited by the number of trains each individual player has. This makes it essential to communicate what you can clearly, so that if one player runs out of trains far before the other, your partner can finish your routes. Great fun! Ticket to Ride Asia expansion is our first expansion for the original game as my husband and I kind of got a little bit bored with the original map so this expansion really helped us to ‘refresh’ things out. The reason we chose this expansion was due to it being labeled as ‘Number 1’ (sequence wise, not rating) and we are hoping to buy the rest of the expansion sequence within the following months. Add a Review for "Ticket to Ride: Asia"